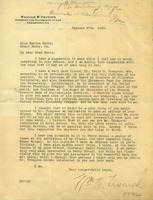 After talking on the phone with Martha Berry, William Trawick (an attorney in Cedartown, GA) writes her a letter discussing the most effective method of contacting Mr. Thompson to come to speak to the students at the Berry Schools. 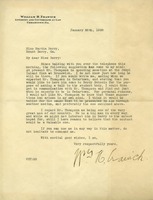 A Letter to Mr. Trawick from Martha Berry inviting him to come visit the Berry School and have a luncheon with her. 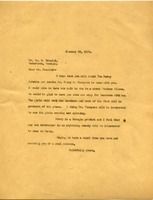 She also asks him to invite Mr. Henry B. Thompson to come.